Often times when I use my computer, my son will come to my desk and try to get my attention. He sometimes grabs the mouse and demands either to play games or draw a picture. Here are two pictures he and I drew using the Windows Painter. Enjoy. I must write this post to get over my batch of Breaking Bad posts. There are three seasons of it so far so I figure I should write three posts to match it. It is weird thoughts indeed. 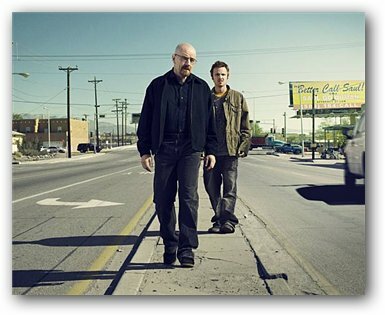 The TV series first interests me for a few reasons, such as the job and the cancer situation of Walter. But the most important one is seeing how a fifty-year old loser teacher as well as a cancer patient can beat the odds. To modify a line from another TV series about drug-dealing Weeds: will this “over-qualified, under-achiever” give in under the crush of this unfriendly world? There are, however, a few disappointing episodes in season 2 and 3. I feel the playwrights forgot the fight for survival theme and distracted into boring scenes of family disputes. The episodes about Walter’s wife having an affair or bitching about a divorce ruined the tension and the suspense in the show, that is, to fight for survival. In my opinion, the best part of the show is the scenes when Walter and Pinkman are caught in crises and how they managed to get over in one piece. I am still looking forward to watching season 4 next year, but I hope the meth lab chemist can beat the weeds grower (as in Weeds) in the consistent of producing quality. Come back Hisenberg and the little Jassie. By the way, the episode 10 of season 3, which is titled Fly really turned me off and I hope it won’t come back again. Hisenbery and Jessie will be back in 2011.